While I’m embracing the new Canadian anti-spam law as an opportunity to stop receiving a ton of unwanted emails, I’m dreading the idea of asking my JC readers to re-subscribe to the Jittery Cook blog to keep receiving weekly recipes. The devil on one shoulder assures me that the law doesn’t apply to little old me as JC is not a commercial enterprise. The angel on my other shoulder simply tries to do everything by the book and worries about having a million dollar fine. Any spam is too much spam. But is there such a thing as too many pesto recipes? I think not. I’ll gladly collect your pesto recipes and give them each a whirl until the day my processor stops processing. Blend all ingredients except for the cheese in a processor. In a medium sized bowl, combine greens and cheese. Serve on pasta, grains, vegetables or as a condiment in a sandwich. Serves 6. 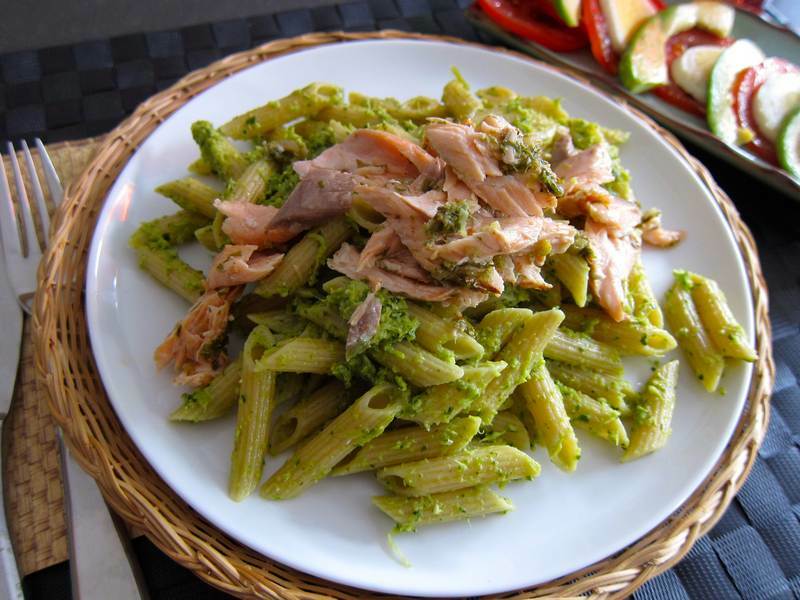 Serve Garlic Scape Pesto with just penne or penne and grilled, flaked salmon. A side salad of tomato, avocado and hard boiled egg sprinkled with zesty Herbamare makes your meal complete. Garlic Scape Pesto can also be frozen. Recipe is adapted from the Crisper Whisperer. 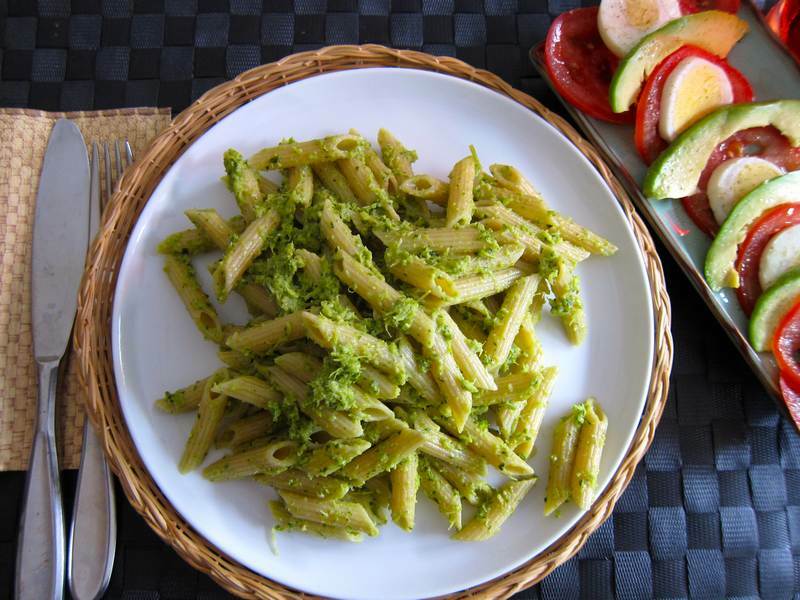 This Garlic Scape Pesto is full of flavour and good health. CSA Box week 1: Every week throughout the summer I’ll be collecting a box full of farm fresh organic produce from La Terre Bleue in Elgin, Quebec, run by Jamie Quinn and Nora Johnston. Finally, my very own CSA produce. These hardy garlic scapes popped out of the first box just a week ago, and they will only be available for 1 more week. Stay tuned to JC for more local harvest-to-table recipes. Your invitation to re-subscribe to JC may be coming soon. Thanks Erna! That’s 1 down, hopefully more to go. Send me the subscription notice! Where can I get garlic scapes? You’ll get the re-subscription notice if I ever find out that it’s necessary. For now you are subscribed. Last year my sister brought me garlic scapes from the country. This year they came in my organic produce box. Maybe they sell them at the farmer’s market. Anyone know? 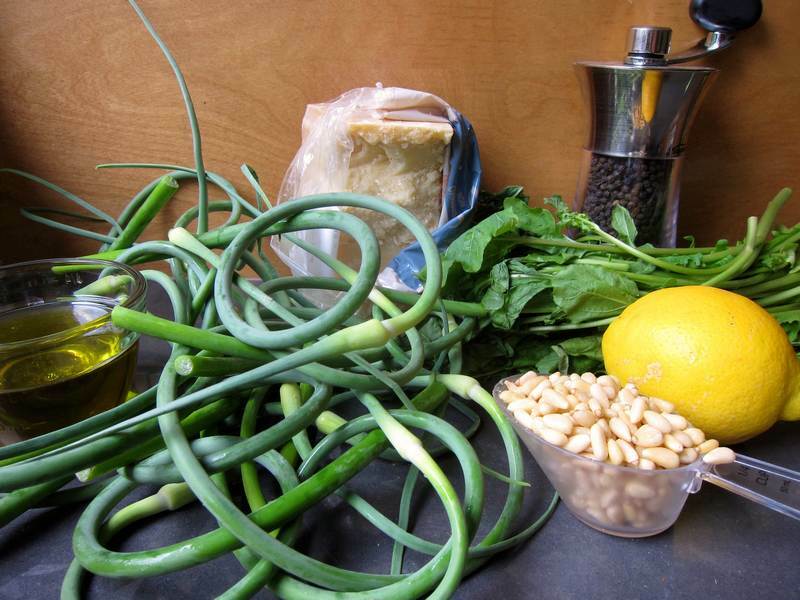 Here’s a link to Lufa – they may have garlic scapes. looks good. Don’t get the garlic scapes in my CSA box. I guess they grow around Montreal and aren’t too widespread elsewhere. They’re relatively new to me. Everyone who is subscribed will stay subscribed for now. Thanks for staying with JC! I think with a food like garlic scapes it takes some experimentation to get to know if and how we like the flavour. I’m always curious to try new foods and new recipes. I’m sure you’ll like some of the upcoming recipes. Mind reader! Radishes coming up shortly. If you can’t wait I’ll send you a preview.